Annie Ajami's book store, Faulkner & Friends provides not just a book store but a salon and haven for writers, and a beacon of culture in a run-down neighborhood. But just when the fledgling store seems destined to become financially viable, offering a lifeline to a better future for the destitute characters who have become her adopted family, the shop is plunged into a world of violence and Annie's dream for a literary life falls to ruin, like scattered pages from a broken bookbinding. "If I didn't know better, I'd swear there's something in the water coming down the river that blooms good writers in New Orleans like magnolia blossoms: Faulkner, Rice, Percy, Toole, etc. And now here's the newest one to squeeze the heart to offer up its secrets. 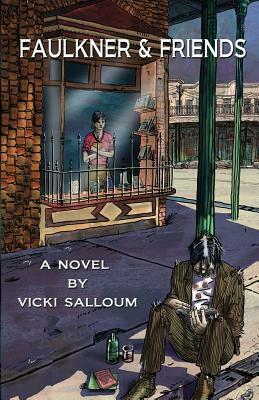 Faulkner & Friends is a wonderful read; that it's set in New Orleans is lagniappe." -- William Greenway, Ph.D., Author of "Everywhere at Once" and "Fishing at the End of the World." "The need to have sympathy for those whom society has left behind, even at personal sacrifice, is key to the novel." --Ruth Latta, author of "The Songcatcher and Me.